My boyfriend introduced me to almond milk last year and I have to say, this stuff is amazing (see my post on making pudding with almond milk here). Almond milk is great for anyone who doesn't use enough milk to use it before it spoils. Almond milk will last unrefrigerated for months as long as you haven't opened it, so it's great to keep on hand for cooking. It will keep in the fridge for a few weeks after it's opened (I think the box says 10 days but we've kept it much longer without a problem). For the most part, you can substitute almond milk for cow's milk in recipes but sometimes, it will change the taste of what you are making or the chemistry of using milk is important, so you have to be careful and maybe give it a trial run before you serve it at a dinner party or something. There are also lots of different types of almond milk - sweetened, unsweetened, vanilla - which you'll want to take into consideration when buying some to keep on hand. There are problems with this at my house because I will use a small amount for cooking and would prefer the unsweetened, unflavored but the person who ends up finishing it has different preferences when it comes to using it in coffee or on cereal...these are the issues of small household management. Keeping this in mind, I wanted to make a quiche. Normally, I would use light cream (or maybe heavy mixed with a little milk, depending what was in the fridge) but this requires the purchase of dairy products, ergo advance planning. After a little online research, it seemed like making quiche with almond milk was possible so a I gave it a whirl, doing what I normally do but using almond milk instead (see my post about my first time making quiche (the standard cream way), a bacon-cheddar quiche here) . 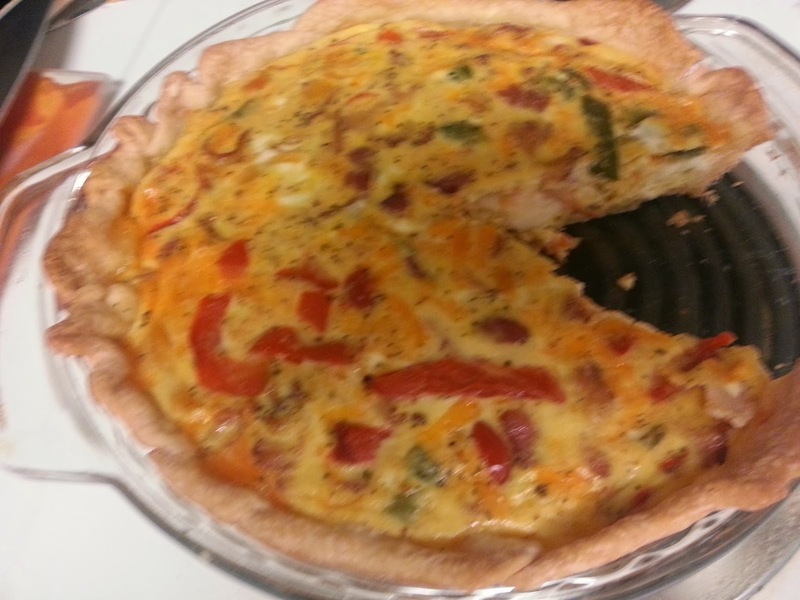 This quiche turned out fluffy and delicious! If I hadn't told you I made it with almond milk, you never know the difference. Not only do I not have to make a trip to the store for cream, using almond milk instead of cream is much healthier. Enjoy! 1 cup almond milk to every 4 eggs, ideally you want an unsweetened and plain (not vanilla) almond milk but I actually used a vanilla flavored one and we could not taste the difference. Baked 28 minutes at 350 degrees. Different quiche recipes will call for different numbers of eggs, amounts of milk but honestly you will probably have to adjust depending on the depth of your pie plate and how much cheese/toppings you put in. It's pretty hard to screw up, don't be afraid because it has a fancy French name! Update: after this worked the first time, I've made a bunch of quiches with almond milk. It's a great week night dinner for us. However, I tried coconut milk recently, because it was all we had and I expected it would work the same and it did not. The quiche was very rubbery and I won't be trying it again. If you are looking for a Paleo option, try this frittata recipe. This post contains some affiliate links to demonstrate the products used. If you purchase from this link I will receive a small commission. This came out tasting wonderfully! I used regular almond milk (not vanilla) and left out the garlic salt. I did add in some red peppers, onions, spinach and baby portobello mushrooms. 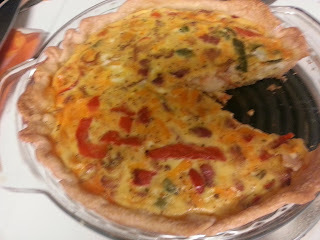 However, it took nearly an hour before my quiche was cooked through. Just wanted to give a heads up for those trying it that you need to allow extra cook time the first time around to see how long your oven takes. Hi Jennifer, I'm glad you liked it! Thanks for your note on the cooking time, I've also had the experience for a quiche to take longer to cook (more like 50 minutes!) depending on the oven, so great advice to try it in your own oven first! Accidentally used vanilla too... could totally taste the difference. :P Would have been much better with plain unsweetened NONvanilla almond milk. You have a typo up there. You wrote '... ideally you want an unsweetened vanilla almond milk but I actually used a vanilla flavored one and we could not taste the difference.' I think you meant to say 'non-vanilla'. Some brands vanilla flavor must be stronger than others. Our chicken and spring vegetable quiche was very very vanilla ish! Ha ha. Yes you are right! I changed it to make it more clear. I used 3 eggs and 3/4 cup low fat unsweetened almond milk. ALso added 1# mushrooms and shallots (2 med) with red pepper (3/4 cup) suteed in 2 Tbl unsalted butter . Sprinkled on top chopped scallions and 1/2 cup cheese (any kind shredded). Baked 45 min. @375 Turned out excellent. Should have read the reviews before cooking. The cook time is off for sure. My family is waiting for dinner and it's nowhere near done after 30 minutes at 350 - and I have a hot oven! truth!!! had to up the temp to 425 and it actually went an hour! .. I am at 25 minutes and it certainly is going to need longer that 5 more minutes..... BUT, I really fiiled that pie shell with blanched asparagus, green onion and a 4 oz round of burrata - all of which i had to use! So its the kitchen sink quiche! Baked some procuitto and capocola chips to crunch on top when it comes out of the oven and plan on serving it with a slice of tomato and fresh fruit - with glasses of prosecco topped with lemon sorbet -a late afternoon brunch. Lazy day, so time doesnt matter... it smells really good though! Update it took about an hour.... DELICIOUS! So glad to know i can use almond milk instead of regular milk! Ihave no problem with cheese, but milk doesnt sit well with me. This is great!